In this review, I rate how well MailEssentials meets these challenges. The review is based on an online demo of the product and independent anti-spam research. MailEssentials supports Exchange, Lotus Notes, and other SMTP-based solutions, providing multi-engine spam filtering, anti-phishing protection, and business policy enforcement. Using MailEssentials, an organization can manage spam in various ways. First, use of SpamRazor, as a supplement to the core engine, helps achieve the 98 percent blocking rate claimed by GFI. Next, bayesian filtering provides zero-day protection from new spam. Inspecting outgoing mail, the filter learns which email sources are probably valid senders. 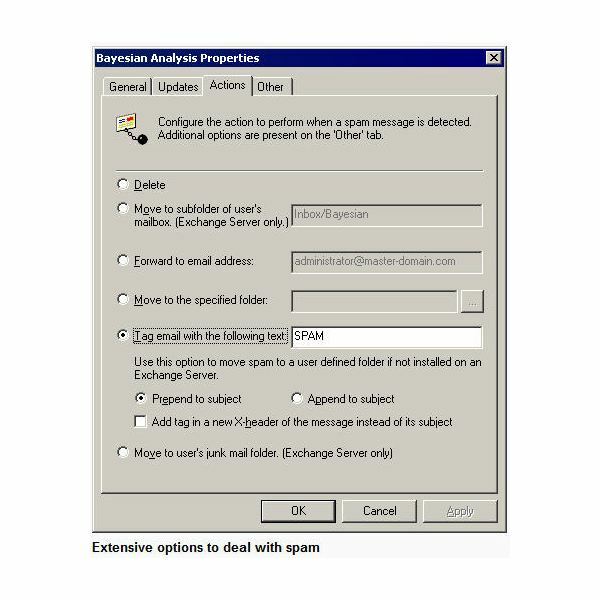 If the capability is turned on, it can also learn about valid email by inspecting public folders into which users drag messages they’ve received. Senders can also be blocked in this way. In addition to using public folders, MailEssentials provides blacklisting via a selection of third party services. A list is shown in the provider selection window below. Using frequently updated lists helps protect against receiving phishing and other email with malicious intent from reaching user mailboxes. Use of keywords is also supported for blacklisting incoming mail. On the other end of the protection spectrum is whitelisting, supported in MailEssentials via IP addresses or domains. Although turned off by default, users can be notified when a "clean" message is received from a source not in the company whitelist. MailEssentials also supports very basic message archiving, a very small subset of the powerful functionality found in GFI MailArchiver. The screen shot below shows the administrative interface which allows message search and restore capabilities. Unlike MailArchiver, only the administrator has access to archived messages. Finally, MailEssentials supports multiple user-defined policies. The administrator can prioritize the policies to achieve desired results. These and other settings, such as blacklist or keyword filtering parameters, are managed using tabbed views, like those shown below. Once configured, settings can be synchronized across multiple servers. Online and vendor help is good, providing all the information necessary for implemention and maintenance for knowledgeable staff. however, this might still be a stretch for organizations with no IT staff or staff with little understanding of managing messaging security. Because of this, I was tempted to drop the ease of use rating to a four. However, the overall strength of the product forced me to go with a five. The cost of implementing MailEssentials is reasonable, as shown at the product site. And you can try before you buy with a free full-featured evaluation copy, available for download. However, it’s important to note that MailEssentials does not include anti-virus protection. If you need both anti-spam and an email anti-virus solution, GFI provides them in the GFI MailDefense Suite. Although the price is right for the features provided, I have an issue with the licensing model. GFI tracks license use, which is fine. However, when the number of users (based on number of mailboxes) exceeds the number of licenses purchased, filtering stops. Even though GFI allows a 15-day grace period following a detected licensing issue, I have a problem with any security vendor automatically dropping protection. For this reason, I dropped the licensing rating to four. Overall, this is an excellent solution for stopping spam from reaching employee mailboxes and for combating phishing. It has a feature set that effectively meets the challenges I listed at the start of this review. Although not as hands-off as an appliance- or service-based solution, MailEssentials is very easy to manage if you have on-site IT staff. Other than the auto-stop for licensing issues, I couldn’t find anything I didn’t like. I highly recommend GFI MailEssentials to anyone looking for an SMB anti-spam solution. Would you like to read more reviews? Look around Bright Hub and you’ll find reviews of numerous other leading security solutions including SpamTitan, GFI LANguard, Norton Internet Security, Kaspersky Internet Security, ESET Smart Security, McAfee Total Protection, Blink Professional and ZoneAlarm Internet Security Suite.